Chavie Weisberger was raised in a Hasidic family — an ultra-orthodox Jewish sect — and “was groomed for the ultimate level of success, which was marriage,” she tells PEOPLE. There are layers, both literal and spiritual, to getting dressed as a Hasidic person or an ultra-Orthodox Jew. It’s like a math equation. For women, there is often a “shell”—a cap-sleeved shirt to cover the collarbone—and then another shirt, sometimes with a collar and typically of a solid hue, that must reach past the elbow. Depending on the sect, or the individual’s or family’s religious preference, there is thick opaque hosiery, sometimes in a peachy orange hue, branded with raised quarter-inch seams running down the back. There is, of course, a skirt that goes below the knee. As for those who leave their lives as Orthodox Jews—the ones deemed as “off the derech” (meaning “off the path,” OTD for short)—they are faced, in the secular world, with both finding themselves and, eventually, their style. “You have to admire that kind of courage,” says the project’s photographer Gillian Laub. 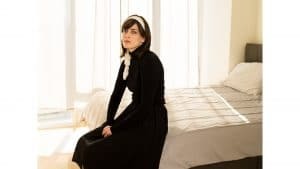 “Risking the loss of everything you’ve known to live an authentic life.” So, what does a post-Hasidic wardrobe look like? In one case, there is Abby Stein, a transgender woman who meets me at a coffee shop near Columbia University, where she is currently studying public policy and gender studies. Now a trans activist, she was once a rabbi who hailed from a high-ranking Hasidic dynasty, a mishmash of two of the most extreme sects, Bobov and Satmar. She is a direct descendant of the founder of Hasidic Judaism, the Baal Shem Tov, and compares her early life to something like being born into European royalty. Stein eventually left the sect with the help of Footsteps, a nonprofit New York–based organization that provides support to the ultra-Orthodox looking to leave the community.